We have copied and translated the following article – originally published at The Guardian – because we consider it important that our Catalan and Spanish-speaking readers understand the text properly. I was 13 years old with a red ribbon cascading on my oiled hair when I got my first period. I thought I had dysentery. When I asked my mother about it, she slammed a bunch of rags in my hand and said “nani ta nachune bhais” – my daughter, you become untouchable [you are menstruating]. She pulled me inside my brother’s room. I remember it was dark and creepy. Then came a list of restrictions: “Do not touch the kitchen and worshiping area”, and “Stay away from your father and other relatives”. I had to stay alone in brother’s room for a week. What hurt the most was not able to see my father or any male members of my family during those days. I asked my mother several times: “Why can’t I go outside the room?” But she stayed silent. The crippling sensation running deep in my entire body, the red blood was a sin. The same red blood that represents me as a woman. In a fit of rage, I would enter the kitchen and touch everything that my mother restricted. I would eat pickles from refrigerator, singing and touching everything. The second time I menstruated I kept it a secret. It was just a normal day for me. I woke up, went to the kitchen and did whatever I liked. Then when everybody knew I was on my period and touching everything it turned into a heated debate. I was lucky enough that my father was progressive and supported my move. ‘Women around the country are not as lucky as me. 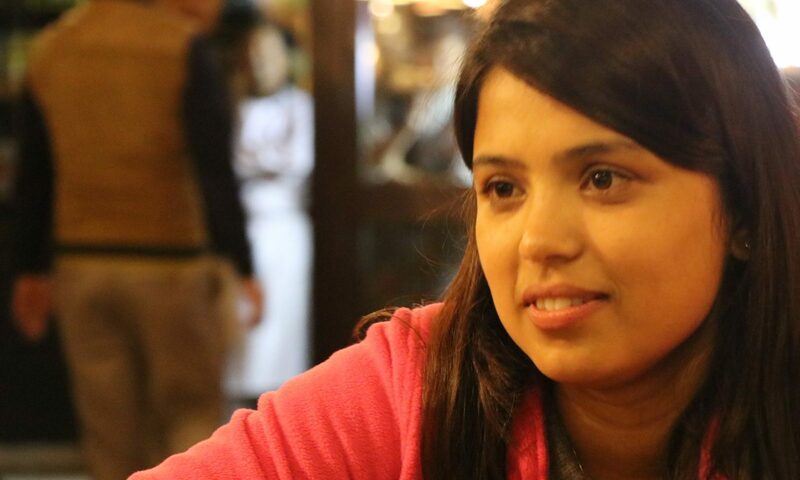 The situation of women living at the rural areas of Nepal is terrible,’ says Pragya Lamsal (pictured). But women around the country are not as lucky as me. The situation of women living at the rural areas of Nepal is terrible. The practice of isolating women during their period exists across the country in differing forms. In some places, women cannot be in their own homes. While in others, women can be in the house but not in the kitchen and worship room. They are also forbidden from touching other people (especially male members of the family), cattle and growing fruit and vegetables. In Nepal, menstruation is associated with stigmatising traditions and restrictions for women. I’m calling for an end to the – sometimes deadly – suffering. The most extreme form of seclusion is practised in the western part of the country. Chhaupadi banishes menstruating women to live in sheds outside the houses. Recently, two young women died in menstrual huts in Achham, a hilly district in far-west Nepal, in less than a month. On 18 November, Dambara Upadhyay, 21 from Timilsen village was discovered dead in the shed while a fifteen-year-old girl Roshani Tiruwa of Gajra died on 17 December. They are not the first and sadly we can’t say for sure that they will be the last. The exact numbers are not available but it is believed that dozens of women die every year in the name of tradition, as if menstruating women do not deserve basic human rights. Chhaupadi was outlawed by the supreme court of Nepal in 2005. But the police often see menstruation as a private family issue. The government’s indifference is taking toll on women’s lives. How many more women must die before taboos and stigmas surrounding menstruation come to an end? Further, little attention has been paid to the other severe health impacts associated with menstrual taboos and stigmas. Women suffer from pneumonia, diarrhoea, suffocation and respiratory tract infections while they are in seclusion. During my visits to remote areas of the country, women tell me they are not looked after properly by family during menstruation. Speaking up against menstrual taboos is not easy. There are many initiatives across the country but the tradition is deeply rooted. For example, the villages where young women recently died had been declared a menstrual-hut free area. Families had pledged to discontinue the practice after shed-demolishing campaigns. But they resorted back to the practice and the newly-built sheds were found to be even worse than the previous ones. Another challenge is that women themselves believe the traditions. A schoolgirl in Udaypur, eastern Nepal, once told me that God will curse her if she doesn’t follow the rules of seclusion during her period. Girls continue the practice because they fear God will be angry with them and they will bring misfortune on the family. The government needs to take a new approach to this issue. Legal initiative and awareness campaigns must go hand-in-hand. I have long been advocating that it is not cultural issue. It is a human rights issue. It is not a part of religion but part of superstition. It is against women’s rights. It is also a legal issue. But it’s not a matter for Nepal only, smashing menstrual taboos should be part of international initiatives. Women’s right are ensured by the Convention on the Elimination of all Forms of Discrimination against Women and the Universal Declaration of Human Rights. As the UN and countries around the world agreed to the 2030 agenda and sustainable development goals, it is a matter of concern for the whole world. It is time to ensure a world where women are entitled the right to live with dignity and respect.